This week we're going to take a look at one of the new videos about heat embossing that is a part of our My Favorite Things Tips & Tricks series on YouTube. I bet you've seen a really cool design and thought to yourself, "How did they do that?" These videos HERE give tips and tricks for some of our favorite crafting techniques. The brief tutorials will have you crafting like a pro in no time flat! 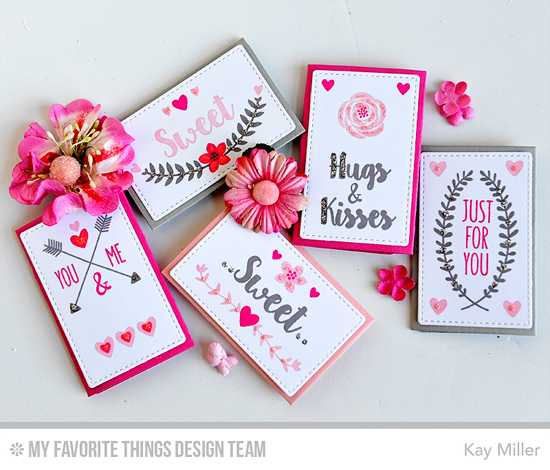 Today's video will give you a step by step of how to heat emboss using a very pretty flower from the Modern Blooms stamp set from My Favorite Things. Watch the video below or click HERE to watch it on YouTube. So informative, right? Kimberly has some great tips for how to heat emboss with the best results possible and some great ideas for quick clean up! Let's take a look at a few examples of other projects that incorporate heat embossing to create three very different looks. Barbara stamped the Mini Hearts Background stamp with Versamark on watercolor paper, and then she pulled out her Peerless Watercolors. You'll see her embossed hearts resist the color and shine through. I love how she cut a frame from her watercolored panel and then cut several more frames from plain card stock to add dimension. Her lovely sentiment was stamped in gold and then she added heat embossing with gold detail embossing powder. 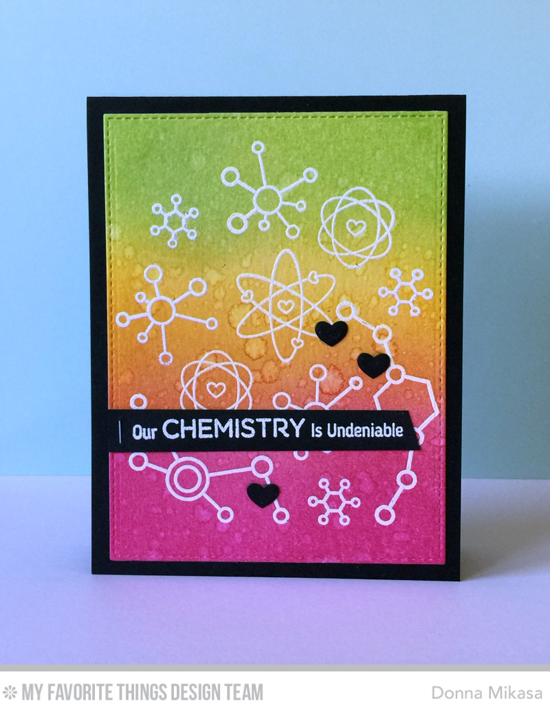 Donna white heat embossed several of the images from the Undeniable Chemistry stamp set on watercolor paper and then used distress inks and a few splashes of water to create her colorful background. You can see that she also heat embossed her sentiment with white detail embossing powder. The Embossing Magic pouch is essential in pulling this off! Now it's your turn to create using your heat gun and some embossing powder! Be sure to tag #mftstamps when you post your projects online. We can't wait to see what you've made! Love these samples using heat embossing, it's such a great technique for so many different looks!